It is critical for enterprises to have a secure and reliable Internet connection that enables productivity for all their data needs and processes. 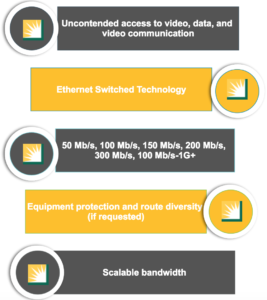 Edison Carrier Solutions’ dedicated Internet access for enterprises provides continuous, high-bandwidth connectivity with synchronous upload and download speeds. It is a secure solution organizations can rely on. Poor Internet access and unreliable connections can reduce productivity and efficiency. Dedicated Internet access includes features that lower the risk of problems and increase connectivity so enterprises can focus on what’s most important – growth. With a standard Internet connection, your enterprise is at a higher risk of cybersecurity threats. SCE Carrier Solutions’ dedicated Internet access for enterprises is a reliable and secure solution that reduces your risk and helps ensure data security.